Identification: Acer platanoides is a fast-growing, deciduous tree commonly 40 to 50 feet in height in cultivation, but can reach up to about 100 feet. It grows in temperate zones (USDA hardiness zone 4 through 7A). Typically, the tree has an oval or rounded crown with a central leader and heavy, dense leaf canopy. The bark of the tree is gray and very smooth as a sapling, developing shallow and regular grooves with age. Leaves grow in pairs on opposite sides of the stem and have a palmate structure with sharp central points and symmetric secondary points on each lobe. The leaf has what most people would call an archetypical maple leaf shape. The number of lobes per leaf is usually 5-7 and the leaves are usually green in color, 4-7 inches wide, but there are a number of cultivars with distinctive characteristics, with a dark red color being the most common. The normal green form turns a showy yellow in the fall, often as one of the very last trees to turn color in the season. Acer platanoides is conspicuously covered by numerous greenish-yellow flowers in early spring (April-May in the New York City region). Flowers are small, typically 0.25 wide, and held in rounded clusters, or peduncles, as the leaves first start to emerge. The fruit are flat, elongated "winged seeds" held in opposite pairs, 1 to 3 inches in length, green when immature and then turning brown. The maple family is large and can appear somewhat homogeneous. The most similar is the North American native sugar maple, Acer saccharum, which has similar habitat requirements and pattern of growth. However, the sugar maple can be distinguished from Acer platanoides by a typically lighter green leaf, more irregular bark (thick, irregular plates), thicker seeds, and clear sap rather than milky when a leaf petiole is broken. In Europe, another closely related species, Acer pseudoplatanus, the Planetree or Sycamore maple, has been planted more broadly as a street tree and exhibits many of the same invasive habits as the Norway maple. Acer pseudoplatanus is planted as a street tree in the United States as well, but never was accepted as the Norway maple or various native species, for it lacks their dignity and outstanding fall color. While it naturalizes here as well, it is not nearly as common. Original Distribution: Known as the Norway maple, Acer platanoides actually is native to a much broader geography. It occurs naturally in continental Europe and the Caucasus region, from central France in the east into central Asia Minor and northern Iran in the west, and from southern Norway and Sweden to northern Spain, Italy, and the Balkans. Current Distribution: Today Acer platanoides has a broad distribution due to its extensive planning as a street and ornamental tree and its successful naturalization to nearby woodlots, forest edges, roadsides and fragmented forests. From there it has moved on to less disturbed habitats. 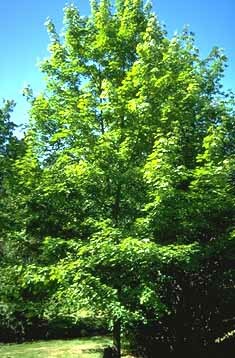 In the United States, Acer platanoides is common throughout the Northeast, ranging as far south as North Carolina and Tennessee and as far west as Minnesota. Isolated populations also occur in the states of Washington and Idaho. All the central plains and mountain states are considered potential planting range for its future spread. Site and Date of Introduction: For at least three centuries, Acer platanoides has long been planted widely throughout Europe and North America as a street and ornamental tree. It was introduced to Britain in 1683 and into London in 1683 (British Ecological Society, 1945). The earliest importation to America was to Philadelphia in 1756 (Nowak and Rowntree 1990) by John Bartram, who later offered it for sale in his garden catalogue of 1762. It was introduced into Canada in 1778 (Canadian Botanical Conservation Network, invasive tree species list, www.rbg.ca). Mode(s) of Introduction: As a popular and easily transplanted shade tree -- perhaps the most common street tree in the United States (Nowak and Rowntree 1990) -- planting by human beings has been the principal mode of introduction. Once introduced, its fertile and plentiful seeds and its wide tolerance of habitat have enabled it to spread further very quickly – an experience any homeowner with a mature Norway maple can attest to. Reason(s) Why it has Become Established: The reasons why Acer platanoides became a favorite street tree are key to its success there as well as in its naturalized state: it's a tough, vigorous, fast-growing tree with a wide tolerance for light (from full sun to part shade) and soil type (from clay to loam to sand in composition, and either acidic and alkaline). It is known to be tolerant of pollution, growing successfully even in compacted soil in crowded and hostile urban environments. This tolerance makes it an effective invader of disturbed areas. As Acer platanoides competes with native forest trees in a larger ecosystem of increasing acid rain and air pollution, pollution tolerance may give it even more of a competitive edge in the forest as well. Acer platanoides casts an extremely dense shade and has a shallow root system, and is notorious for suppressing lawn grasses underneath it. The same qualities are also effective in suppressing both the diversity and the total amount of undergrowth in a naturalized setting. Acer platanoides flowers early in the spring, before many other trees and shrubs, a habit that may favor fertilization and account for some its fecundity. The British Ecological Society's profile (Journal of Ecology, 1945) notes that Acer platanoides flowers three weeks before the sycamore, Acer pseudoplatanus, and that its flowers are "energetically visited by Bombus spp. and Andrena spp." Vigorous reproduction and seeds that have a wide lateral dispersal due to the winged structure of the fruit, followed by seedlings with rapid growth and excellent shade tolerance are a good recipe for an invasive species. In addition, Acer platanoides seeds can lie dormant and germinate several years later, should a change in weather or a disturbance provide a growth opportunity. Ecological Role: Acer platanoides is a dominant forest tree in its original habitat and, when naturalized, displaces other dominant trees, particularly sugar maples in the northeastern USA. In a 1993 study of the invasion of Acer platanoides into the Drew University Forest Preserve (Webb and Kaunzinger), the number of Norway maples is gaining compared to the sugar maple in particular, which grows more slowly and is apparently reproducing more slowly as well. The contrast in the sizes of the two tree populations is particularly evident in the seedling counts. In addition, a significantly reduced number of spring wildflowers occur under Norway maples compared to those under other trees, probably due to the dense shade of the Norway maple understory. This reduction of understory diversity has also been noted elsewhere (University of Connecticut, University of Massachusetts, Illinois Extension Service). Acer platanoides is a fast growing, heavy seeding tree with strong tolerance for drought, pollution, poor and alkaline soil with good resistance to pests. Those traits make it an ideal invader for disturbed areas and abandoned fields. It also is a tough competitor in established forests, due to excellent shade tolerance and rapid growth. Benefit(s): There are clear aesthetic benefits in the ornamental features of the tree, including its ability to grow and cast shade quickly in disturbed ground, as are most man-made landscapes. In addition, a number of ornamental cultivars have been developed that provide a range of attractive leaf color and growth habits. In the mid-twentieth century, the tough and pest-resistant Norway maple was widely planted as a replacement for the dying American Elm street trees. Indeed, the U.S. Department of Agriculture's Forest Service still touts Acer platanoides 'Summershade' in a Fact Sheet published in 1993 but still posted on its Web site, as a tree with "outstanding ornamental features" and suggests that "it could be planted more." Acer platanoides' ability to tolerate pollution, drought, and inferior soils mean that it can colonize habitats where other trees might struggle. It serves a beneficial role in naturalizing disturbed sites. And the heavy annual seed crop provides a source of food for a number of birds and rodents. Threat(s): The success of the Norway maple threatens not only to crowd out the sugar maple, and possibly other direct tree competitors, but also to reduce the bio-diversity of the forest understory. This reduced bio-diversity is itself a concern and becomes doubly so when seen in light of the compounding effect of other invasive species such as barberry bushes, smothering bittersweet and Japanese honeysuckle vines, as well as the over-grazing due to the proliferation of deer in many of the same forests. The composition of the whole eastern forest community is at risk, and the role of each invasive species needs to be better understood. Reduction of sugar maples in the northeastern forest will also have a direct economic impact on the relatively small commercial business of producing and marketing maple syrup and sugar. It could have a more significant economic impact on a much larger business: seasonal tourism or “leaf peeping.” The annual draw of stunning autumn foliage in New England, where the sugar maples provide brilliant accents in orange and red foliage, could be greatly diminished if Norway maples replace them. Control Level Diagnosis: Medium priority. While Acer platanoides is a relatively new threat to established forests, the convergence of increasing forest fragmentation through urban sprawl and the accelerating invasion of Norway maples into established forests could quickly tip the balance and complete its penetration of the forest in the northeastern US, and possibly elsewhere. Meanwhile, the trees continue to sell well in the nursery trade and to be introduced ever more broadly. Norway maples are popular on the commercial ornamental tree market -- two Norway maple cultivars ranked among the top six nursery offerings in the northeastern U.S. throughout the 80s (Norwalk and Sydnor 1992). The fact that they grow quickly and are easy to propagate makes them favorites of growers and nursery owners, and the fact that they transplant well, grow quickly, and are tolerant of many tough conditions makes them favorites of buyers as well. More consistent advice from arboriculture authorities will be necessary. As long as some authorities recommend planting more Acer platanoides, warnings from other authorities and ecological groups are likely to be ignored. Better understanding the impact of these trees on established forest and woodlands -- not just the lawn, shopping center, and golf green -- is critical before it is too late. Major ecological destruction has not yet been proven to result from Norway maples, but warning signals are there and the threat may well be bigger than it seems. Control Method: Most commentary on controlling the spread of Norway maples stops at mechanical controls -- advising the reader to pull out seedlings while small, or to gird larger trees. These are techniques that require ubiquitous -- and repeated -- human intervention and have obvious limitations. Breeding of sterile cultivars is a possible alternative, though that always leaves open the possibility of a random fertile mutation. Better and more consistent education to encourage people to grow alternative trees for ornamental purposes could help slow the human spread of the species. One extreme control measure may be unleashed already: the Asian long-horned beetle, which has been found in locations in both Chicago and Brooklyn. If this beetle spreads, worry about invasion of forests and reduced biodiversity due to the Norway maple, one of the beetle’s host plants, would cease. Unfortunately, it would be replaced by a much worse consequence, for the Asian long-horned beetle does not discriminate the Norway maple from other maples -- or even from half of the other deciduous trees in northeastern forests. If the beetle does succeed in naturalizing, we move from concerns over reduced bio-diversity and crowding out of native species to large-scale devastation. Gilman, E.F., Watson, D.G., November, 1993. Fact Sheet ST-38, adapted by the US Forest Service, Department of Agriculture, from a series of the Environmental Horticulture Department, Florida Cooperative Extension Service, Institute of Food and Agricultural Sciences, University of Florida. Michigan Department of Natural Resources, 2003. Trees Not Recommended for planting. Forest, Mineral and Fire Management. Nowak D.J. and A.R. Rowan. 1990. History and Range of Norway Maple. Journal of Arboriculture 16: 291-296. Webb, S.L., C.K. Kaunzinger, 1993. Biological invasion of the Drew University (New Jersey) Forest Preserve by Norway maple (Acer platanoides L.) Bulletin of the Torrey Botanical Club, 120(3), pp. 343-34. Wyckoff, P.H., S.L. Webb. Jul-Sep 1996. 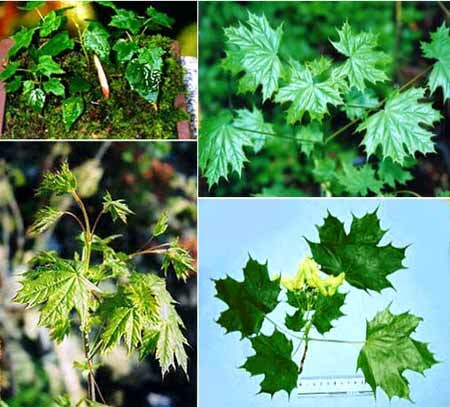 Understory influence of the invasive Norway maple (Acer platanoides). Bulletin of the Torrey Botanical Club 123 (3): 197-205.